You might be wondering exactly what lumens are. Well, a lumen is a measure of the total quantity of light emitted from a source. When you are shopping for any kind of light source the lumens are normally the first thing you consider. Lumens are the amount of light or level of brightness. Bike headlights range from around 100 lumens to over a 1000 lumens. Most 100 lumen lights are too weak to be of much use while ones with 1000 lumens can be blinding to anyone who might be heading toward you. Most city riders find that 350 to 600 lumens are sufficient. 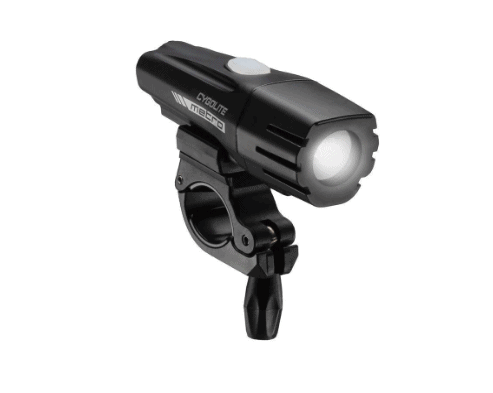 If you’re riding in the mountains or the woods, you may want to look for 600 or more lumens. Headlights should have at least two settings, steady and strobe (see and be seen). The steady beam illuminates the road in front of you so you can see. The strobing pattern makes you visible to others, allowing you to be seen. Many lights now blink and illuminate simultaneously so that you are able to see and be seen at the same time. Brilliant! The Metro 400 is one of the brightest lights you can buy for under $60. Its shine reaches 135 meters, which is around 440 feet, providing great illumination if you’re cycling on a poorly lit street or bike path. There are lights in the same class as the Metro 400 that provide a broader light flow, like the NiteRider Lumina 550, but the Metro 400 is still a great choice if you rarely pedal in complete darkness. One of the best things about the Cyglolite lights is the steady, pulse mode. This simultaneous blink – steady pattern is super noticeable when you’re in traffic. The light has some other modes including a very bright, eye-piercing day flash (be careful with this one so you don’t blind anyone) and a walking mode that uses low power to save battery. The mount is a hard, quick-release that installs to your handlebars, instead of a silicone strap. The Metro 400 has a pretty narrow beam pattern though, which can be an issue if you’re cycling on a poorly lit path or road. If you’re at all like me and go on long, sometimes adventurous, all day rides with your friends on the weekends where, after a few wrong turns and unexpected bonus miles, you find yourselves on a dark country road racing to catch the last train out of Port Jervis back to Manhattan, the Metro 400 would not be a good choice of light for you. The battery on the 400 lasts a little over two hours on high mode. Lights like this one are intended for shorter commutes in high mode. If you use it in a low mode, you can extend the battery life by about 10 times. Most bike lights only advertise a few hours of run time. Through the winter months when my commute both ways is often in the dark, I usually have to charge my lights (whichever ones they are) every couple days. Also, back to those long adventurous weekend rides; last Christmas Day my friend Darren and I decided it’d be a great idea to ride to Bear Mountains and back (about 120 miles round trip from New York City). Metro North trains don’t allow bikes on holidays so we had no bail options but figured we’d be fine as the last 40 or so miles back were on a car-free bike path. Except that it gets dark at 4:30, the path was unlit, and our light batteries were quickly flashing their low warnings. And there was ice. We managed to get to a Metro North station and the conductor let us on without any trouble. Ever since then, and especially in the fall and winter, I usually bring along the USB cord to my light and a charging battery. Because you just never know. If you go on much longer rides or always want to have a charged battery, Cyglolite also makes a light called the Expilion 850 that has a swappable 3.7-volt lithium ion battery. It comes with one battery stick included. You can buy extra batteries for around $40 each. Some users complain about the Metro’s mounting bracket, saying it’s a little too tight to slide the light in and out of easily. Which, is something you’ll want to do if you lock your bike up on the street. The left/right swivel screw can come loose easily also, which causes the light to flop around some. If you’re on a budget and only commute occasionally (and not often in complete darkness) and not every day, the Metro 400 is an excellent choice. Still undecided? Check out our light buying guide and headlight reviews.